Branch art is not unique. Many people use branches as rustic or natural touches in their environments. What is unique is Tom Chambers’ ability to join branches in a manner that looks completely natural. A combination of wood and acrylic, the pieces give the illusion of naturally flowing branches. First, the bark is stripped and the branches are sanded. Then Tom arranges the branches in an artistic pattern. The joints are created using a combination of glue, wood filler and epoxy. A base coat, acrylic paint and a sealer coat are then applied, all by brush. Each distinctive piece of art is one-of-a-kind. Tom’s interest in art began in high school where his first art classes were taught by the man who was his football and track team coach. What started as an easy elective developed into life-long creativity. His passion was ignited while attending the University of Tampa on a football scholarship. There, he studied Sculpture, Drawing and Painting. His art was put on hold after he married, began a family and entered the business world. In 2007, after 34 years in retail, Tom took an early retirement to pursue his love of art full-time. He and his wife Brenda moved from Florida to the mountains of north Georgia. The landscape and terrain provided the ideal setting to expand upon the original branch art idea, conceived at Brenda's request from a magazine photo and his imagination, 15 years prior. Tom is a member of the Blue Ridge Mountains Arts Association in Blue Ridge, GA, has served on their Board of Directors and will again serve in 2019. 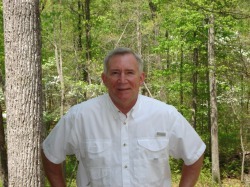 He is also a Signature Member of the Southern Appalachian Artists Guild, an organization under the umbrella of BRMAA. In January 2012, he was one of five member artists to participate in the Regional Art Exhibition at The Bascom: A Center for the Visual Arts in Highlands, NC where his piece “Midnight Blooms” was sold. Also in 2012, he became a member of the High Country Artisans, Inc., a non-profit organization dedicated to enriching the local arts, located in Blairsville, GA. In 2018, Orlando’s Fall Fiesta in the Park honored Tom with an inaugural Award of Excellence. He took Third Place in 3D in the 2017 Southern Appalachian Artists Guild National Juried Show in Blue Ridge, GA where the year before he received an Award of Merit for two of the three pieces that were juried into the show. He also earned an Award of Merit in 2016 and 2017 at Orlando's Fiesta in the Park, where in 2015 he received Second Place Fine Art. 2015 also brought a Best Booth Award at Fall Festival on Ponce and an Honorable Mention at Alpharetta Arts Streetfest. May 2012, Tom was awarded Second Place Overall at the Buckhead Spring Arts & Crafts Festival in Atlanta. In November, he was judged Best in Show at Orlando’s Fiesta in the Park, after placing Second in Fine Art in 2011. The Fiesta committee purchased a 9-piece grouping of artwork to be hung in the Orlando Public Library’s permanent gallery. Tom has artwork in many public locations, including two commissioned pieces in the Union County Community Center, which also houses the Chamber of Commerce, located in his chosen home town of Blairsville, GA. There is one piece residing in the Citizen's Art Gallery at the Tifton City Hall and one piece in the capitol office of Georgia Speaker of the House, David Ralston. In February 2010, he was asked to create a centerpiece sculpture, with the theme of “Lady in Red”, for the Southeastern Horticulture Show in Atlanta, GA. The incredible result was a 5’ tall red ball gown made entirely of tree branches.